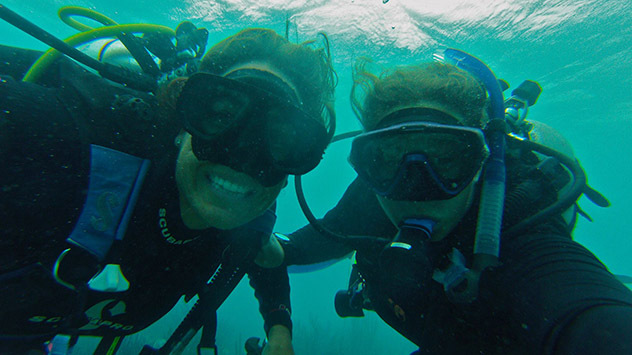 Doctoral student Hannah Reich (right) and her BIOS supervisor Gretchen Goodbody-Gringley pose for a picture during fieldwork in Bermuda. In a recent article in Nature, Reich describes the impact that her mentors have had on her academic career. Supervisors can help to shape the lives and careers of their students and trainees. Sometimes, they become lifelong mentors and eventual collaborators, contributing to a new generation of scientific discovery. And students can forge meaningful relationships with those senior scientists even at the earliest stages of their science careers. In Nature’s 2017 global PhD survey, 34% of respondents said that a supervisor helped them to reach their current career decision (Nature 550, 549–552; 2017). Most respondents said that they were happy with their adviser, but nearly 25% said they would switch if they could. However, supervisors must often learn to lead from their own experiences and mistakes. Here, four researchers at different career levels share stories of good supervisor relationships they have experienced, and what made those relationships so effective. During the final year of my undergraduate studies at Clark University in Worcester, Massachusetts, my adviser, Deborah Robertson, helped me to pioneer a collaboration with Gretchen Goodbody-Gringley at the Bermuda Institute of Ocean Sciences in St. George’s. This collaboration allowed me to conduct research on juvenile coral in Bermuda and to transport samples back to Clark, where I completed molecular lab work for my master’s degree. These researchers hadn’t been working together before. Being able to connect them and have my own niche was exciting to me, and the collaborative and explorative approach to science championed by Deborah and Gretchen is something I have continued to follow during my doctoral research. My supervisor, Todd LaJeunesse, unhesitatingly let me spend a couple of summers in Taiwan with oceanographers and chemists to conduct my PhD research. Mentors have pushed me beyond their labs. In an ideal situation, having a mixture of mentors with different academic strengths, cultural backgrounds and advising styles allows the student to observe and internalize their mentoring expertise and what makes each of them a great scientist. Because I had shifted towards being more globally networked, I knocked on doors that weren’t necessarily labelled as open, seeking collaboration and idea exchanges.